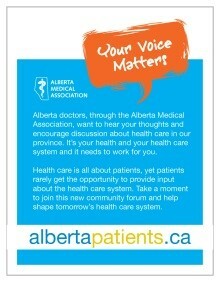 This is our last issue of the albertapatients newsletter for 2015. As we look back over the first (almost) six months of operations, I want to thank each and every one of you for joining this growing community. We are nearly at 1,500 engaged and active members and we will keep moving. Eventually, we hope to have as many as 15,000 Albertans sharing though this space. The AMA board has received -- and will continue to receive – regular updates on what you are doing, the surveys you’ve taken and the conversations you are having. Health care can take a long time to move, but every bit of insight that you give us as patients makes us, as doctors, better advocates for a Patients First® system. The Board of Directors is excited about what you have done so far and will do in the year ahead. I look forward to following your journey and benefitting from your wisdom. Prescriptions and health care. Did you know? A significant number of patients are visiting doctors to obtain prescription renewals. When asked about the last time they saw a doctor and received a prescription, nearly twice as many albertapatients members we spoke with said they received a renewal for a medication they had already been taking compared to those who received a prescription for a new medication (59% renewal, 31% new). An additional 10% received both a new prescription and a renewal at their last visit. 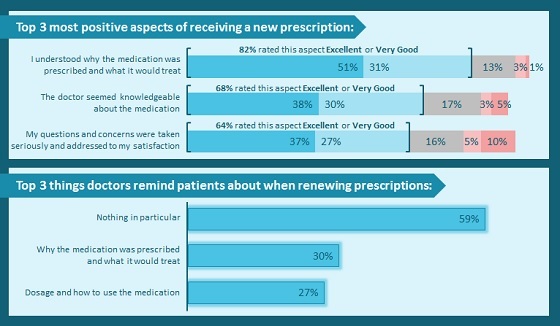 Patients receiving prescription renewals are having considerably different experiences than those visiting doctors for new prescriptions. While some respondents told us that their doctors are reminding them about various aspects of their renewed prescriptions, the majority (59%) indicated that their doctors are not reviewing what the medication is treating, dosage and use, side effects, risks, or interactions. On the other hand, 4 in 5 albertapatients members we spoke with said their doctors did a good job of explaining why new medications are being prescribed, and around two-thirds agreed that their doctors seemed knowledgeable about the new medications and were able to answer questions. Most members we spoke with (43%) are taking medications exactly as they have been prescribed.